Corvair 700 - Full color 7 3/4" x 11" ad has a drawing of a Blue de Luxe Corvair 700 being examined by a family. The ad headline claims that this is the car "with the engine in the rear where it belongs in a compact car". Corvair 700 4-Door Sedan - Full Color 10" x 14" ad for the fact that Thrift is compulsary in the compact Corvair. The ad shows two views of a Red Corvair 700 4-Door Sedan, the first with a young mother loading it up with a cart full of groceries as well as her two young children and the second picture shows a 5-passenger Club Coupe seen from the side with a female sitting in the passenger seat. The text mentions how it mentions how this car squeezes a gallon of gas, how this car is air-cooled and how this will give you savings on insurance, license fees and on tires. Corvair 700 4-Door Sedan - Full color 9 1/4" x 13" ad that is for Body by Fisher. The ad has a picture of a blue 2-door body floating against a red background and another picture of a Blue 4-Door parked next to a couple that are raking leaves on a sunny day. The ad headline says "Silent partner Built-In Quality of Body by Fisher". This ad is larger than my scanner bed so the outer edges of the ad will not be visible in the scanned view. Corvairs - Full color 9 1/2" x 12 1/2" ad that indicates that Motor Trend has made official what everyone already knew, that the Corvair was the Car of the Year. There is a picture of two ladies with golf equipment standing next to a Corvair 700 2-Door 5-Passenger Club Coupe with a golf hole with a mean left-dogleg drawn into the background. The text touches on some of the various selling points of this car; "the way it scoots by filling stations, the lower rates you pay in many cases on insurance and license fees and the savings on tires" before getting more specific about the many amazing features of this car. 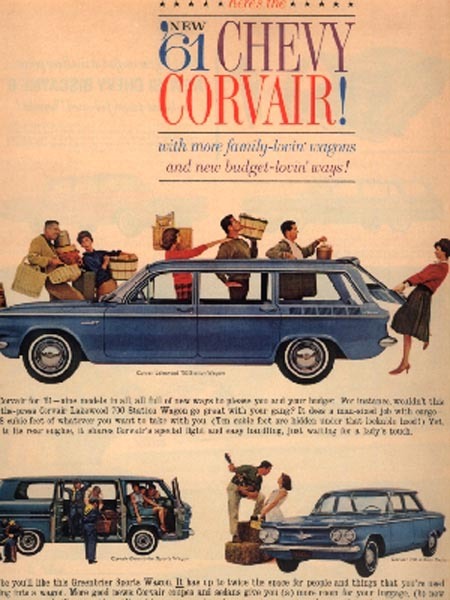 At the bottom of the ad is a picture of a Corvair 500 4-Door Sedan filled with a family. 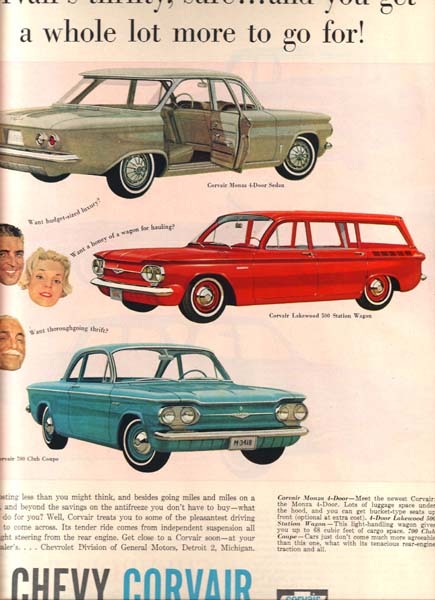 Corvair - Full color 10" x 13" ad shows a blue Corvair 700 Lakewood Station Wagon and a red Corvair 700 4-door Sedan. The ad headline claims that these cars are "Improved in every important way!". This ad is larger than my scanner bed so the outer edges of the ad will not be visible in the scanned view. Corvairs - Full color 6 1/2" x 10" ad that gives you "Three thrifty ways to go wandering". This ad has pictures of a Gray Corvair Monza Club Coupe, a Blue-Green Corvair Lakewood 500 Station Wagon and a Red Corvair 500 4-Door Sedan. Chevrolet Corvairs - Full color 10" x 13" ad shows five different models available. 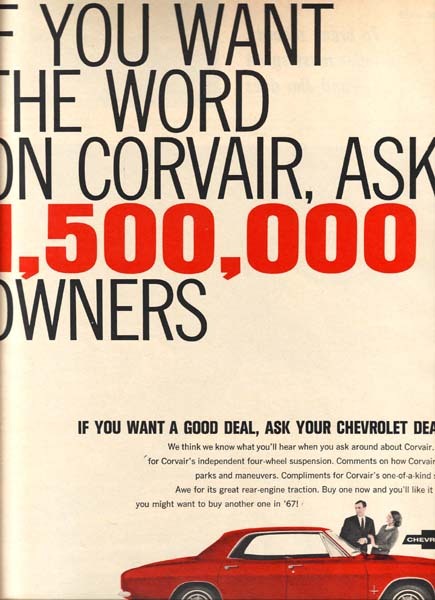 The headline promises that "Chevy Corvair can please your pocketbook...and then some!" Corvairs - Full color 10" x 13" ad shows three different models. 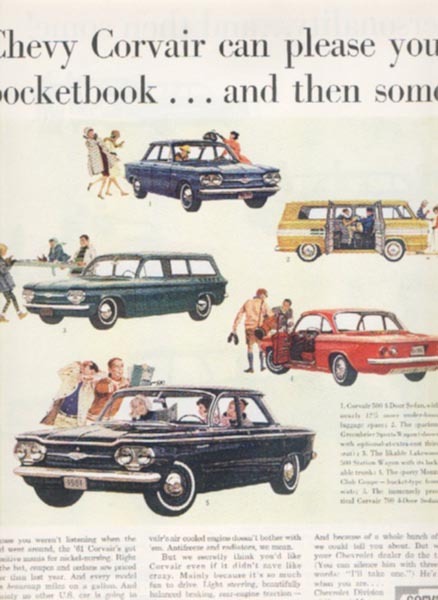 Shown in the ad are Corvair Monza 4-Door Sedan, Corvair Lakewood 500 Station Wagon and the Corvair 700 Club Coupe. Corvair Monza - Full color 9" x 12" ad that lets us know that, if we were looking to buy a 1961 Corvair Monza, we had a choice. The ad has drawings of a Gray Four-door and a Black Two-door each with a female in the passenger seat and a door opened. The ad headline informs you that you can "Take your pick of a pair of Corvair Monzas (with two or four doors)" and that there were 10 different models to choose from. The text mentions some of the irresistable features these cars had which they hope is all the persuasion that you would need. Corvair and Corvette - Full color 10" x 13" ad for The Sporty Car in Chevrolet's New World of Worth. The largest picture shows a White Corvair coming right at the camera as it is driven on a winding, hilly road that goes through mountains and woods. This car, it is claimed, is "Built for budget-minded people who go for sports car driving" and there is also a smaller picture of a Black Corvair Monza. The text talks about the many improvements you will notice in this car; cigaret lighter, front door armrests, dual sunshades and an automatic choke, before mentioning more important changes and the different models available. At the bottom of the ad is a picture of a Red Corvette Convertible supposedly being driven on the grass by a fun-loving couple. This text mentions styling changes and the addition of a 327-cubic-inch engine. Corvair Monza - Full color 10" x 13" ad shows a Corvair holding the road as it flies through a series of mountain curves. The headline proclaims that it "goes around pretending it has power steering". A small color photo at the bottom of the ad is of the 1962 Corvette. It assures us that the Corvette "makes going better than getting there". There is a small water mark along the bottom of the ad. Corvair Monza - Full color 9 1/2" x 12" ad has a large photo of a Blue Monza driving up an incline of a very rocky area. The ad headline claims that this car "climbs like it's wearing gym shoes". There is also a smaller photo of a 1962 Corvette. This ad is larger than my scanner bed so the outer edges of the ad will not be visible in the scanned view. Corvair Monza - Full color 9 1/2" x 12" ad has a photo of a tan Monza being driven toward the camera in a rocky outdoor setting. 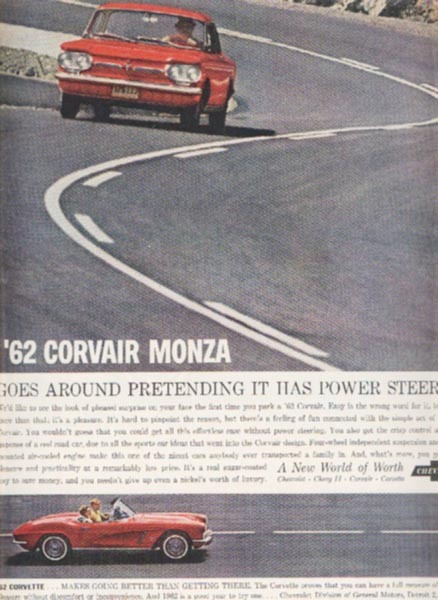 The ad headline claims that "Corvair Monza believes there's no such thing as a bad road". There is also a smaller photo of a 1962 White Corvette being driven by a man show is sharing the car with his dog. This ad is larger than my scanner bed so the outer edges of the ad will not be visible in the scanned view. Corvair Monzas - Full color 9 1/2" x 12 1/2" ad that discusses how well all models of the '63 Corvair stick to the road. The ad has a picture of a lady driving a White Corvair Monza Convertible with the top down on a dirt road overlooking a lake. Below this is a picture of a Red Corvair Monza Coupe that is parked in front of a office building where a modern lady has parked it and is going into her job in the city. The ad headline claims that when you drive the car you will swear that it is "Mated to the road like it's married to it". This ad is larger than my scanner bed so the outer edges of the ad will not be visible in the scanned view. Corvair Monza - Full color 9 1/2" x 12" ad has a photo of two men driving a White Convertible through some rough terrain and a Red Monza Club Coupe parked on a city street with the driver side door opened as Betty Skelton puts her day's shopping in and prepares to sit down. The ad headline says of this car that "It growls for the men - purrs for the girls". This ad is larger than my scanner bed so the outer edges of the ad will not be visible in the scanned view. Corvair Monza - Full color 10" x 13" ad that tries to convince us that driving in the city, traffic and parking issues, doesn't have to be annoying. The ad has a picture of a Blue '63 Monza 4-Door Sedan being driven on a city street and a picture of a lady in a red coat walking in an empty parking lot toward her White '63 Corvair Monza convertible that is parked with the top down. The ad identifies the driver of the Blue Corvair as Betty Skelton who is a pilot and holder of car driving records. The ad headline claims the Corvair Monza is a car "For girls who think they hate city driving". Corvair Monza Club Coupe - Full color 9 1/2" x 13" ad that insists that now, with this car, it's "Even Easier to Get Around In". The text goes into detail about how the engines have been beefed-up and bright new touches have been installed to improve the styling and interiors. It tells us that many luxury features are standard on these cars and, among the ones mentioned are all-vinyl interiors and map pockets on each front door. The Monza Club Coupe is one of seven models that were offered that year. 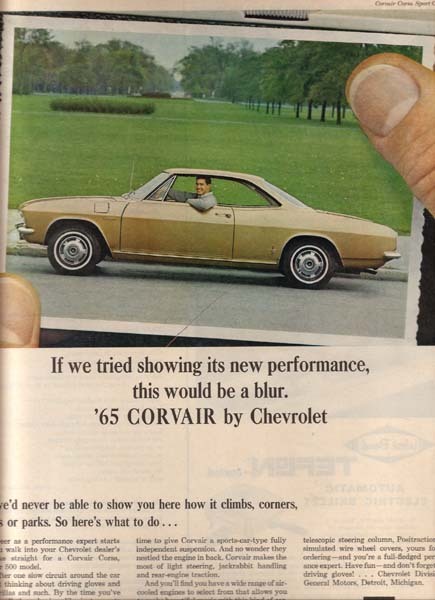 Corvair - Full color 9 1/2" x 13" ad that discusses the wonderful handling these vehicles provided. There is a picture of a Yellow Corvair Monza Spyder Convertible being driven with the top down on a trip in the countryside. As the driver is approaching a bridge with toll booths he is passing a sign that says "Squeeze Left" and his female passenger, ready to follow the law to the letter, moves as close to the driver as she can. The headline says that "Because of the way it hugs and squeezes...you'll fall in love with a beautiful buy" and the text goes into the familiar details about what this car could do an any roadway and any kind of traffic. Corvair Monza Club Coupe - Full color 9 1/2" x 13" ad for the car that the whole family wants. The ad has a drawing of a businessman sitting and patiently waiting at the bus stop while his wife is seen driving their Red Corvair Monza Club Coupe home from a shopping expedition. The ad headline informs us that "About the only thing that can come between a Corvair owner and his Corvair is...his wife". Corvair Monza Super Sport - Full color 10" x 14" ad for the car that has Beautiful Shape for '65 - Corvair. If this one doesn't knock you right off your chair, we can't imagine what would. There is a piccture of a light-green Corvair parked facing away from the reader with the lady who is a passenger in the car looking toward the reader along with the dog in the rear passenger seat. The ad tells us that It took one of the most dramatic car changes ever made to bring you this new beauty with the international look. Here, briefly, are some of the wonderful things we've done to the 1965 Corvair. Chevy Corvair Monza Convertible - Full color 9 1/2" x 12 1/2" ad with a photo of a red Corvair parked in a pasture with sheep grazing in the background and the Pacific coast beyond them. The ad headline claims that "You'll recognize the name, but not the face, back, side or even the ride. '65 CORVAIR by Chevrolet". This ad is larger than my scanner bed so the outer edges of the ad will not be visible in the scanned view. Corvair Monza Sport Sedan - Full color 9 1/2" x 13" ad that claims that, beside the other safety features designed into the Corvair line, they are all designed with hardtop styling. 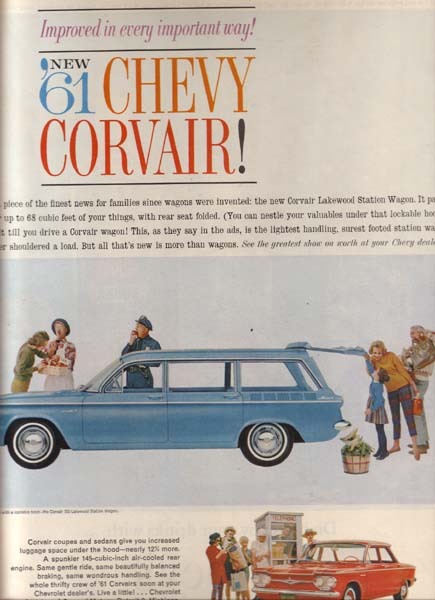 The ad has a picture of a Blue-Gray Corvair Sport Sedan parked in front of a wood planked building where a wife watches her husband easily unloading a large picture from the back seat of this Corvair. This is a task that is only made possible by the fact of no pillars between the side windows. The ad headline tells us that "This year, all the coupes and sedans have hardtop styling - even the lowest priced ones. '65 Corvair by Chevrolet". Chevrolet Corsa Sport Coupe - Full color 20" x 13" Two-Page ad for the improved models offered by Chevrolet this model year. The ad headline says "Let Chevrolet put you in beautiful shape for '65". Beside the Corvair this ad has pictures and descriptions of the Chevelle Malibu SS Coupe, Chevrolet Impala SS Coupe and the Chevy II Nova SS Coupe. Each page of this ad is larger than my scanner bed so the outer edges of the ad will not be visible in the scanned view. Corvair Corsa Sport Coupe - Full color 10" x 13" ad shows hands holding a photograph of a man sitting inside of a parked gold Corvair. The ad headline claims that "If we tried showing it's new performance, this would be a blur. '65 CORVAIR by Chevrolet". This ad is larger than my scanner bed so the outer edges of the ad will not be visible in the scanned view. Corvair - Full color 10" x 14" ad with a picture of a turquoise Corvair Monza Sport Sedan parked on a dock while the couple who drove up in it stand out talking to a man who has fish, most whole but one is sliced, for sale. 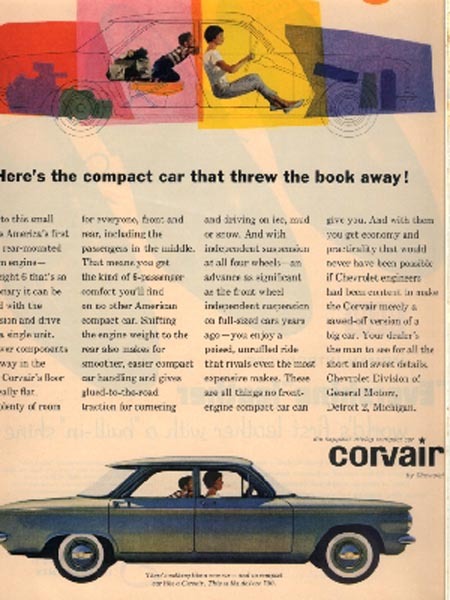 The ad headline says The car: Corvair by Chevrolet. The appeal: Universal. It goes on by saying The reason: It's different from any other American car before going into a variety of detail about what makes this car different. 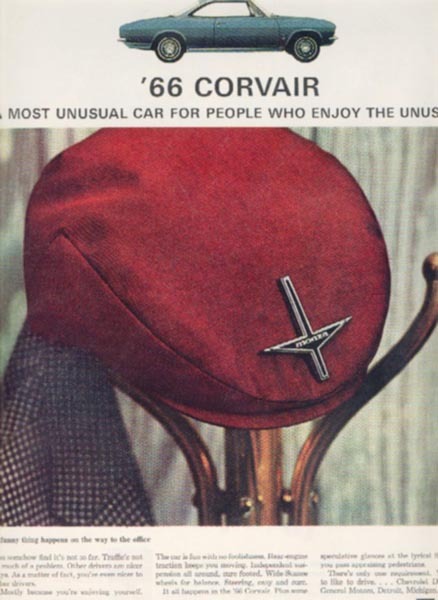 Corvair - Full color 10" x 13" ad for "A most unusual car for people who enjoy the unusual". There is a small picture of the Corvair and a larger photo of a red racing cap with a "Monza" insignia on it. 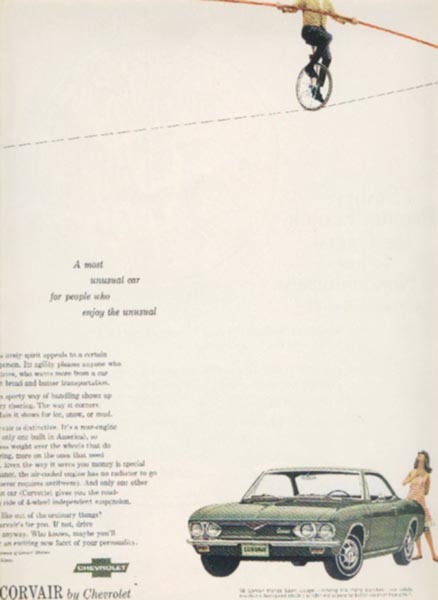 Corvair Monza Sport Coupe - Full color 10" x 13" ad shows a man walking a tightrope high above a parked Corvair. Corvair Corsa Sport Coupe - Full color 9 1/2" x 13" ad has a photo of a Blue-Green Corvair Coupe with a couple leaning on, and admiring, this vehicle. The ad headline explains that "You speak independent suspension, four-on-the-floor, bucket seats and like that? We hear you." The ad also has a photo of a Red Corvette Sting Ray Sport Coupe. This ad is larger than my scanner bed so the outer edges of the ad will not be visible in the scanned view. Corvair Corsair Convertible - Full color 10" x 12 1/2" ad shows an elderly lady smiling away as she drives in her Corvair with the top down. 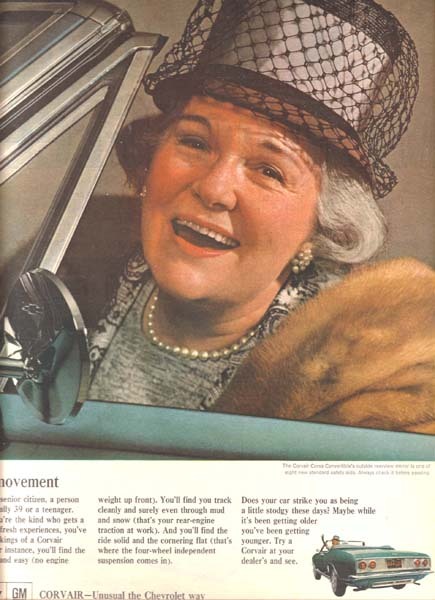 The ad headline simply says "Youth movement" at this infraction of a old lady driving a young person's car. The text talks about how you can be any age and drive a Corvair and it goes into the variences that this car will give the drivers of it..
Corvair Monza Convertible - Full color 10" x 13" ad has a picture of a Red Monza Convertible with the top down taken from behind. Leaning on the all-important rear end of this car is an attractive blonde who is immersed in travel brochures while the older man who is sitting in the driver's seat sits impatiently looking back at her. 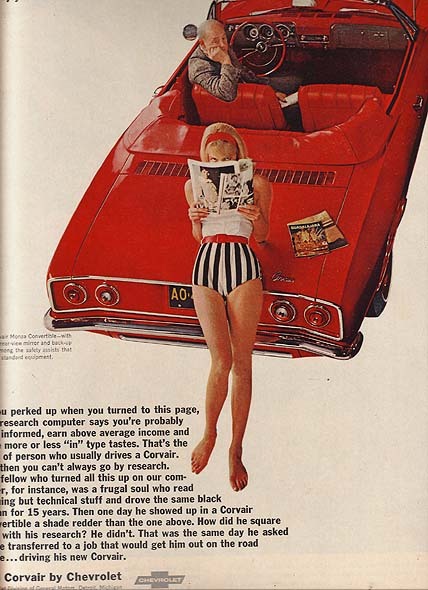 The ad calls the car "A most unusual car for people who enjoy the unusual" and the text with a little tongue-in-cheek logic claims that "If you perked up when you turned to this page, our research computer says you're probably well informed, earn above average income and have more or less 'in' type tastes". This ad is larger than my scanner bed so the outer edges of the ad will not be visible in the scanned view. Corvair Corsa Sport Coupe - Full color 9 1/2" x 12 1/2" ad with a large photo of a woman with red-hair and sun glasses pulled low on her face. There is a smaller photo of a red Corsa Sport Coupe and the ad headline claiming that "Some of the most enthusiastic Corvair owners are people who thought driving was a bore". This ad is larger than my scanner bed so the outer edges of the ad will not be visible in the scanned view. Corvair - Full color 9 1/2" x 13" ad has a large photo of a young, professional-looking woman in a brown outfit with a briefcase and an umbrella. There are several smaller photos of a maroon Corvair and the ad headline claiming that "The more of a stand-up-and-be-counted individualist you are the more you'll enjoy driving a Corvair". This ad is larger than my scanner bed so the outer edges of the ad will not be visible in the scanned view. Corvair Monza Sport Sedan - Three color 10" x 13" ad with the large headline question "If you want the word on Corvair, ask 1,500,000 owners". There is a photo of a red four-door sedan in the ad with a couple looking at it while the wife tries to pull the husband away. This ad is larger than my scanner bed so the outer edges of the ad will not be visible in the scanned view. 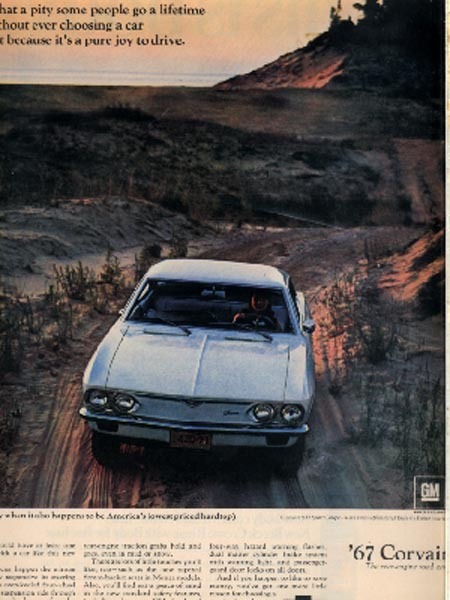 Corvair 500 Sport Coupe - Full color 9 1/2" x 12" ad has a photo of a blue Corvair driving on a dirt and gravel road through a tree covered countryside. The ad headline lets us know that "Some cars travel best on 4-lane superhighways with lots of gas stations. (Let this one take you away from all that)". Below this it touts "Corvair 500 Sport Coupe. America's lowest priced hardtop - $2128" and, when you sit open-mouthed at the price, you have to remember the difference in time. The ad goes into detail maximizing the value and minimizing the cost by talking about the "air-cooled 6 (which never needs water and uses gas only with utmost moderation)" makes you consider, somewhat, buying a Corvair.